Tomas Alfredson’s second feature, after 2008’s Let the Right One In (original Swedish version) is a much more ambitious and “serious” film. 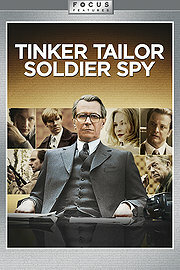 Adapted from the eponymous 1974 John le Carré novel, it presents us with many characters (portrayed by an ensemble cast of British actors, including John Hurt). Atmospherically and stylistically this is a masterpiece. in a sense, it is akin to what Mad Men does with '60s advertising ad agencies, except applied to '70s British secret intelligence. It presents that dreary, gray and brown, gloomy world of old men huddled up in rooms with cigarettes and mountains of documents while hypothesizing about soviet plots. It might not sound exciting, but visually I couldn’t resist but be completely engulfed by it. The plot is, as one would expect, rather difficult to follow. Not only does it start in medias res, in line with other le Carré work, but it also jumps back and forth between present and flashback, characters and events that at times I found myself going back to earlier parts of the film which seemed to make no sense when I watched them, but shape the part of the plot that I’m watching now and are essential to understanding it. It’s not entirely unpleasant (and can even be rewarding, when finally getting the whole picture, to understand what some parts were about) but it can be, at times, confusing (though one would think the spy world of the '70s cold war was just that). Overall enjoyable if you can get over the fact that at first it won’t make sense. Yes, there are many scenes where someone that was just introduced would utter some words with a British accent that seem to make no difference to the plot but make all the difference later on, so being attentive and alert to everything and everyone that is present can help, but once you get into the rhythm of it, the overall product is very rewarding.